Built tough with military grade DZX camo exterior and a heavy duty steel frame. Tested to withstand wind, rain, sun and snow. Special built in ground spikes anchor your Kingpin blind to the ground. Remove the heavy duty cover and store indoors after the season for a set up that will last for years. Take the Kingpin out year after year; unlike traditional hub blinds, the Kingpin won’t break or collapse in the wind or snow. The special window covers slide from side to side or open in the middle to any size opening within the window. Blacked out interior and camo mesh window covers keep you concealed. 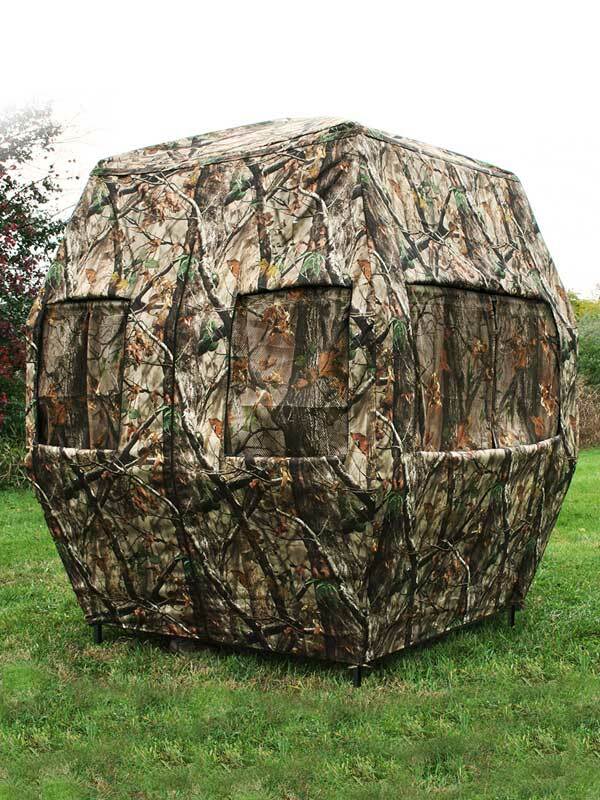 The Kingpin is adapted to work as a ground blind or with our optional Kingpin tower Kit; 9′ (12′ to shooting rail).